Freda is passionate about working with clients to help them enhance their well-being, nurture self-growth, and work on building their resiliency during challenging times. She has experience assisting clients in developing positive insight and finding good coping skills, in order to live engaged and balanced lives. Freda has experience seeing clients across the human lifespan and has specific experience working with immigrants, refugees, and clients within the LGBTQ community. She works to provide a safe environment in order to promote and facilitate changes within client’s lives. She works mainly with individuals and couples to assist with co-occurring disorders, anxiety, self-esteem building, depression, bipolar disorder, trauma, stress management, and relationship issues. Her treatment style utilizes CBT (Cognitive Behavioral Therapy), motivational interviewing, structural therapy, and solution-focused therapies to aid clients with positive thinking skills and better communication techniques. 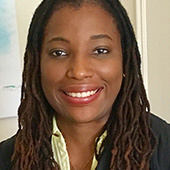 Freda received her Masters in Social Work from Loyola University in Chicago, where she specialized in mental health and human migration studies. She completed her Masters in Child Development from the Erikson Institute. Her training was in a wide variety of environments including refugee resettlement, community mental health, hospitals (both inpatient and outpatient), and she did specific work with child assessments.